Creating an Organizational Forms Library in Exchange 2013 or Office 365 Exchange Online is much easier than creating it in Exchange 2010: at most, you'll need to run three cmdlets to set up the Organizational Forms Library: one to create the Public Folder Mailbox (if a Public Folder Mailbox doesn't already exist), then create the new public folder and set the new folder's EformsLocaleID. These are the two cmdlets you'll use to create the Organizational Forms Library. New-PublicFolder -Path "\NON_IPM_SUBTREE\EFORMS REGISTRY" -Name "Organizational Forms Library"
If you need to lookup the LocaleID, see languagecode Field at MSDN. Once the library is published, you'll need to use Outlook 2010 to publish custom forms to it or use *.fdm files to publish; Outlook 2013 can use forms in the Org Forms library, but can't publish to it. Instructions for Creating an Organizational Forms Library in Exchange 2010 and Create an Organizational Forms Library in Exchange 2007. 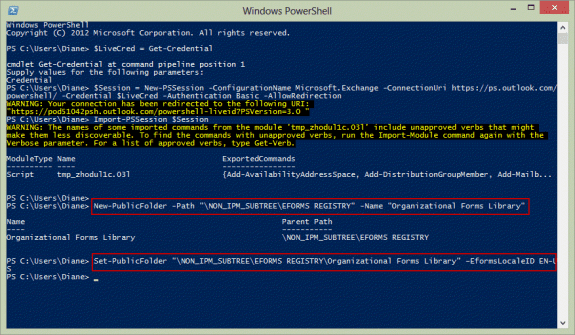 Open PowerShell using Run as Administrator. Run the following cmdlet to bring up the log in dialog. Enter the Exchange server's administrator username and password. Note, you must have administrator rights to the server to use this. When the Public Folder Mailbox exists, run these two cmdlets to create the Organizational Forms Library Public folder and set the LocaleID. Don't forget to change the EformsLocaleID if needed. If your Exchange server supports multiple languages, you can create one Org Library for each LocaleID. You'll need to use a unique name for each library. By default, users should have permission to the Organizational forms library, but if a user does not have permission to the folder, the administrator needs to give the person or group the necessary permission. This can be done using the Add-PublicFolderClientPermission cmdlet. You can use a specific user's alias or email address, or use Default as the user to apply it to everyone. In Office 365 Exchange Online, you'll need to assign Author permission or higher to use the forms library. To publish custom forms to the Organizational forms library, the user needs the correct permission as well. In Office 365 Exchange Online, users will need Owner permission to publish forms. In on-prem Exchange servers, users need at least CreateItems permission. Outlook 2013 users will have access to the Organizational forms library but cannot publish to it using Publish custom forms. Outlook 2013 users can install *.FDM files. First publish the form to Outlook Folders or Personal Forms Library. Open the Forms Manager dialog (File, Options, Advanced, Custom Forms, Manage Forms). Browse to the location you saved the form (*.FDM), select Form Message (*.fdm) as the file type then select and open the saved form. The Form Properties dialog opens. Click Ok to install or fill in the properties then click Ok.
Close the dialogs and return to Outlook. Users will see the forms from the Organizational Forms Library. When you need to use a form published to the Organization Forms Library, you'll use the same method to use any published form: Select it from the New Items > More Items > Choose Form menu and browse to the Organizational Forms Library. The form can be set as the default for a folder too. Select Forms: at the end of the menu. Get-PublicFolderClientPermission -identity "\NON_IPM_SUBTREE\EFORMS REGISTRY\Organizational Forms Library"
Outlook 2010 and above caches the names of the forms in the Exchange Organizational Forms Library. The cache expires every 24 hours. If a new form in the Organizational Forms Library has not been cached, Outlook displays the error. The form is not cached in the Names File cache until the cache expires or times out. To eliminate the error, lower the timeout or disable it. If using Outlook 2013, change 16 to 15 or, for Outlook 2010, change 16 to 14. If you don't want to edit the registry, you can download and run the reg file for your version of Outlook. It wasn't working for me when adding myself as 'owner' on 'Organization Forms Library' eventually i discovered there was 'Organization Forms'. Once i set myself as owner on that I was able to copy the form from personal folder to Organization Forms in Outlook 2016. Install was greyed out before but now it's not. I have a general question. Is it possible to have two different Organizational Forms Libraries? I ask cause our company is wanting to expand Outlook Forms and use some for appreciation and some for business needs. They would like to have a separate forms library for the appreciation forms. Is this possible? No, not separate libraries. The forms can be cateogized on the properties page, which may help keep them separated. I have developed custom contact forms for organizations, with custom fields, and command buttons that run VBscript code to create documents in Word. As organizations migrate to Exchange Online I will set up a shared folder and publish a custom form to that folder. But how do I recreate the macros/automation? I've been told to use PowerShell, is that correct? Do you have other suggestions? It'll work using office 365 the same way it works using on-prem. Only the location of the server changes. You can't run macros using powershell - you will need to either have the code behind the form, or use VBA installed on desktops (preferably a com addin as its easier to push out an update). I created my custom form but I want the other users in the organization to seen. I try to publish it but when I select organizational library the OK Box is frayed out. Also I want my form to have a field that generates a random number this would be used as a ticket number for the users request. How do I do that? You need owner permission to publish, users need author to use the form. to generate a random code, you'll need to add a vb script to the form to generate it. Hi in our oganisation we have recently upgraded Office 2007 running through Exchange 2007 to Office 2013 running through Exchange 2013. I have followed your steps above and have successfully created the "Organizational Forms Library" using the cmdlets provided on Exchange 2013. We have found our exisiting forms in .fdm format and saved to a central location. When going into Outlook 2013 (File, Options, Advanced, Custom Forms, Manage Forms) I can now see "Organizational Forms Library", although empty. When following the steps to save the form to it the Install button is greyed out? It comes back when selecting Personal Forms so I assumed this could be because i do not have create items permissions? but i have ran the cmdlet provided above to give myself create permissions and the permissions have now been set. When i go back onto Outlook 2013 (File, Options, Advanced, Custom Forms, Manage Forms) I can no longer see the "Organizational Forms Library" in the drop down list? Any ideas why this could be? There is a bug in OUtlook 2013 that causes the Organizational Forms Library option to not be present in the drop down list when trying to use the Publish As option. As a workaround, you can publish to your Personal Forms Library and then copy the form to the Organizational Forms Library. To copy the form, go to Options > Advanced, scroll down to the Developers section and click Custom Forms. On the pop-up, click Manage Forms. From there you can copy forms from your Personal Library to the Organizational Library. Assuming your permissions are already set, your users will then be able to see the form in the Organizational Forms Library. Thanks very much Diane, the clues was there I just thought I would be able to do it autonomously. So effectively I need to go to every end point and install the .fdm into the library as per your instruction's. If you use Outlook 2013, you need to install it in the org library using fdm file, you can't publish it directly to the org library. Is it possible to use this method with Office 365 (Exchange online) as well? We have a hybrid environment with Exchange 2010 on premise & Office 365. We are in the process of migrating our public folder to O365, but can't see if it's possible to migrate Organizational forms. You can create an org library in Office 365. I don't think it will replicate with the on-premise server, but I could be wrong, so you'll need to republish the forms. Thanks for the quick reply! Replicating with on-premise isn't to much of an issue, it's only a few dozen, so we can re-publish them. As long as we can get them into O365 and available to users, eventually the on-premise servers will be decommissioned!